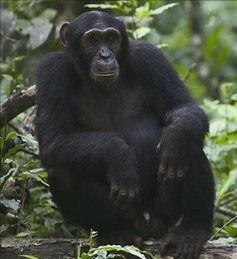 Chimpanzees are apparently among the famous Uganda safari products that are of great interest to the world travelers. Well known for their remarkable intelligence and close relations to human beings, the chimpanzees have become a darling to many and encountering them is never disappointing. Being among the big apes that are still thriving in the verdant tropical forests of Africa and South America, the Common Chimpanzees are noted to have a common ancestral origin along with gorillas and Orangutans. The ancestral touch with humans cannot be missed too. Uganda dubbed the pearl of Africa has indeed maintained and defended the name because of the diverse habitat and the intense bio diversity concentration that is rarely found in other destinations in the world. Uganda boasts of a myriad of destinations where chimpanzees both habituated and non-habituated are known to thriving. Stretching from the Budongo Forest where counts of 800 chimpanzee are thriving to Kibale National Park that has been dubbed the Primate Capital of the world, Semliki National Park to the boarder of Congo marking the point of meet between the East African savanna and the West African jungle, Kyambura gorge known as the valley of Apes in Queen Elizabeth National Park, Kalinzu Forest Reserve and Bwindi Impenetrable National Park, Uganda is by no means an ordinary home of the common chimpanzees some of which have been habituated and thus visited on chimpanzee trekking safaris in Uganda. The concentration of these chimpanzees in varied habitats presents a varied chimpanzee trekking encounter to the Uganda safari tour undertakers. This even comes with a difference in price. For instance chimpanzee trekking in Budongo Forest is $85, in Kibale is $150, in Kyambura gorge is $50 while in Kalinzu Forest is $40 per person. This favors different income level travellers but also the existence of these sites enables the travelers on Uganda safaris and tours to have the opportunity to explore chimpanzee from any direction of the country apart from the east. Trekking Chimpanzees requires you to be in possession of chimpanzee trekking permit and this can be booked way back in advance with Uganda Wildlife Authority to save yourself from losing out but you can also pay on the morning of the trekking date at the respective trekking point provided there is space.